How better to get a packed audience, from first row to last seat in the balcony, rip-roaring excited about a little-told piece of history than through a stage full of high-jumping, midair-flipping, split-legging, fist-pumping guys in perfectly coordinated dance and full-voiced song? Oh, and did I mention that while they gyrate and fly in all directions, three mammoth structures -- each with three stacked layers of Erector-Set-like, metal boxes connected with multiple-staircases -- are moving in and out and rotating among the dancing boys? Just writing this, and my heart starts madly pumping! 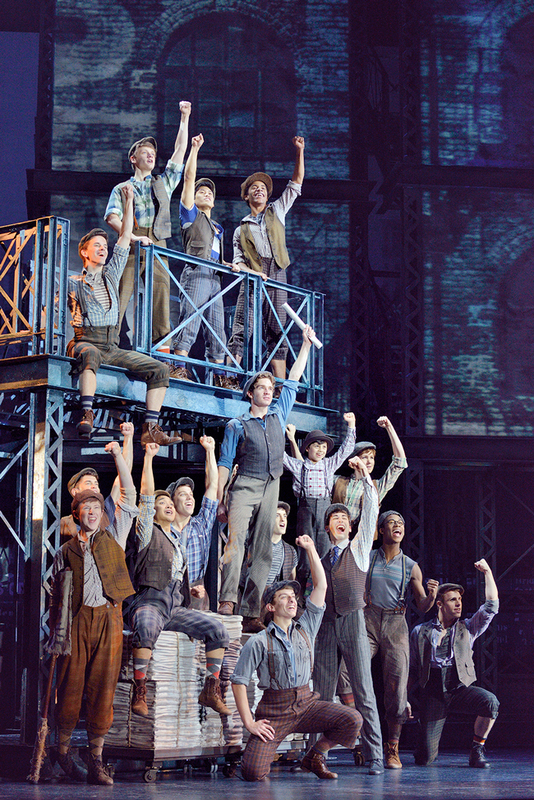 Welcome to the exuberant, testosterone-filled Disney’s Newsies in which Harvey Fierstein’s book’s is based on an actual newsboys’ strike in 1899 New York against the likes of newspaper moguls Pulitzer and Hearst, with the music of Alan Menken and lyrics of Jack Feldman thrown in for electrifying results. Having seen the original 2012 Broadway show with multiple Tony nominations (winning Best Score and Choreography), I can fully attest that the current touring company hosted by Broadway San Jose fully echoes the overall excellence, palpable excitement, and exiting audience elation of the original. Davey’s ten-year-old, kid brother -- the diminutive in stature but giant in spirit, Les – takes on bullies many times his size and often is the high-pitched voice that rises out of the gathered gang to inspire the next steps in the strike’s action. Turner Birthisel (alternating the role with Ethan Steiner) is a ball of energy and action and brings his own notable singing and stepping abilities to this outstanding cast. Newise in "King of New York"
Number after number seems to out-do the previous in electrifying the crowd; but one of the best of the evening has to be the Second Act’s opening, “King of New York.” A full cast, including Katherine and little Les, tap in their boots on tables and floor of Jacob’s Deli while playing a full orchestra of spoons off their knees, arms, and each other – and while also doing yet more leg splits on the floor and high jumps with legs fully parallel to that same floor. Many other cast members have their moments to leave a memory in the audience’s banks. Andy Richardson is Jack’s best buddy with a lame leg, Crutchie -- ever-cheerful and ready-to-fight when needed. His “Letter from the Refuge” is sung with quiet passion and persistent penchant of hope against all odds. 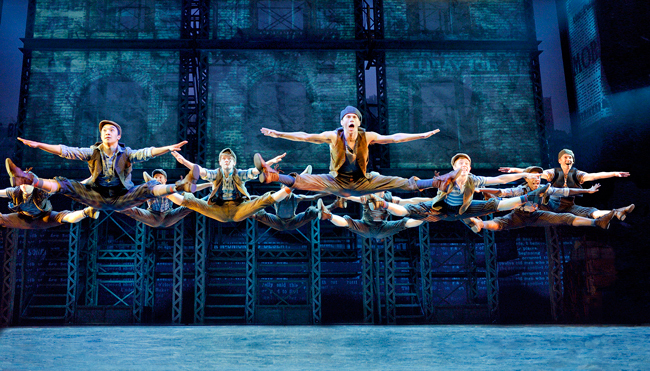 Jordon Samuels is just one of many outstanding Newsies dancers; but as Specs, he time and again totally astounds with high-air acrobatics. Kevin Carolan is a Governor (Teddy) Roosevelt with the sort of bully heroics that one would expect while Alex Prakken and Michael Gorman as the Delancey Brothers are the kind of bullies one can imagine a Pulitzer might always keep around him. The Costumes & Set of "Newsies"
Jeff Calhoun directs this massive cast with an evident knowledge of what it takes to whip up an audience and then lead them to a place to be inspired by the bravery of these boys of 1899. 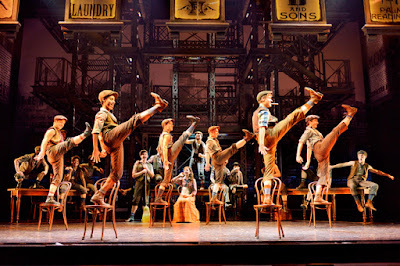 How much kudos would it actually take to acknowledge the mastery of Christopher Gattelli’s choreographic leadership provided to this touring cast, ensuring that the excellence awarded on Broadway by Tonys and Drama Desk alike, continues night after night crisscrossing America? The spot-on lighting of Jeff Croiter and the scene-and-time-period-setting projections of Daniel Brodie enhance the impressive, ever-moving structures of this gigantic set designed by Tobin Ost. And 1899 comes to full life through the costumes of Jess Goldstein. 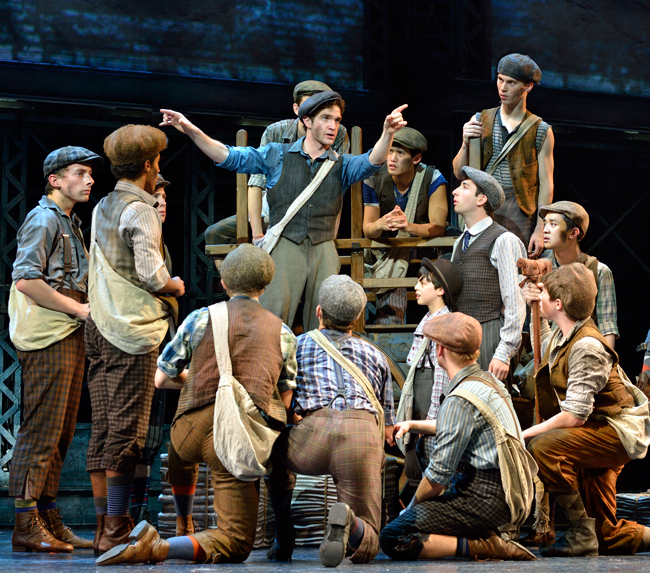 As is often the case for a touring show, the stay is just too short for a show as excellent as Broadway San Jose’s Newsies. With performances only through this Sunday, May 15, now is the time to “Seize the Day” and buy that ticket for this toe-tapping, finger-snapping production. 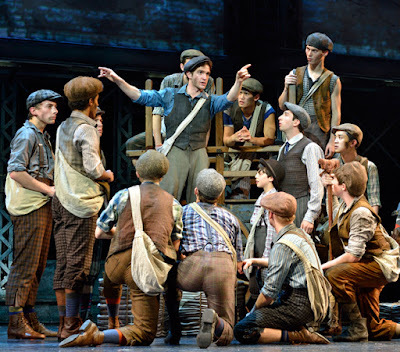 Disney’s Newsies continues through May 15, 2016 at the San Jose Center for the Performing Arts, 255 South Almaden Boulevard, San Jose. Tickets are available online at http://broadwaysanjose.com.